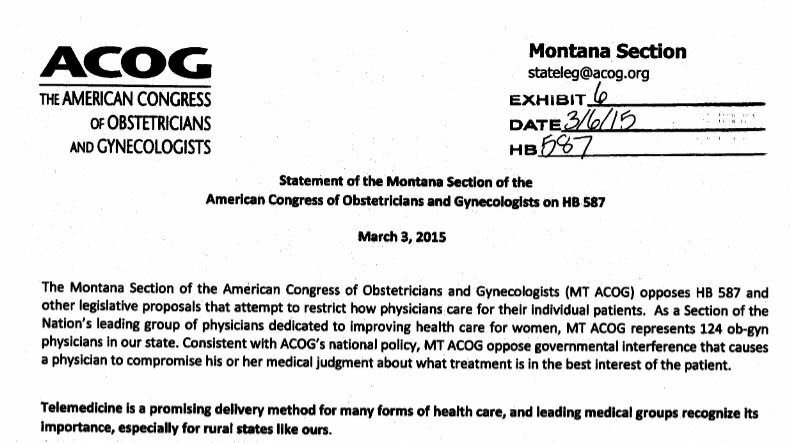 The Montana section of the American Congress of Obstetricians and Gynecologists is admittedly for abortion. They also oppose many abortion restrictions. 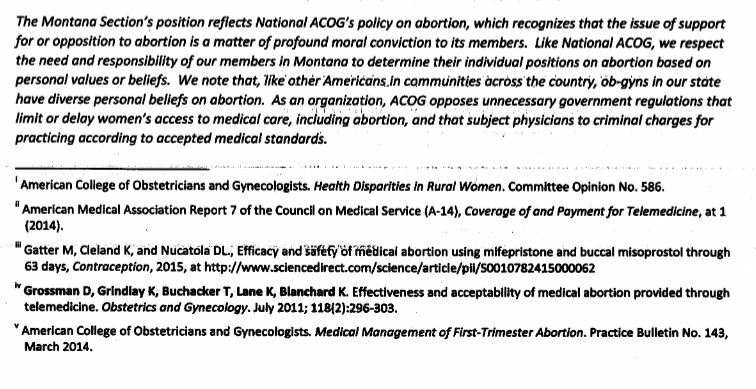 A closer look at the footnotes indicates that two of one of the articles they gathered their telemed abortion reasoning from were authored by the two abortion doctors exposed for selling aborted baby parts in a video sting. 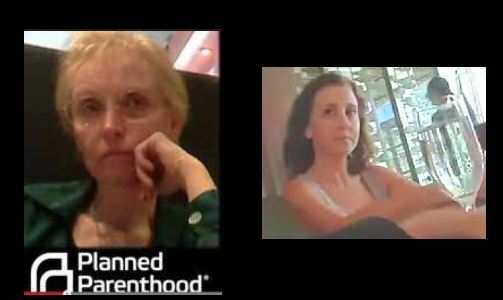 Dr. Deborah Nucatola head of Planned Parenthood’s medical services department bragged how she will crush above or crush below the desired child’s organ to appease “buyers” of the fetal body parts. Planned Parenthood’s Medical Directors’ Council President Mary Gatter described on tape how she would modify the abortion procedure, performing a “Less Crunchy” technique to obtain more “whole specimens.” Gatter then joked about wanting a Lamborghini. Dying for the abortion pill ! This video is from 2005 – since then several more women have died….is abortion worth YOUR life? A summary of adverse event reports (AERS) recently released by the Food and Drug Administration (FDA) and obtained through Sen. Orrin Hatch’s office reveal that in the span of almost eleven years since the approval of the abortion drug, popularly known as RU-486, in the United States, at least 11 women have died as a result of complications related to taking the drug. Internationally, the number of women who have died as a result of RU-486 is at least 17. Clearly highlighting the need for more stringent medical oversight, the report also indicates that 58 women were prescribed RU-486 despite having ectopic pregnancies. Yet, “[a]dministration of mifepristone and misoprostol is contraindicated in patients with confirmed or suspected ectopic pregnancy.” To state it more clearly, a woman who has an ectopic pregnancy and takes the RU486 regimen places her life in danger. It is not only women in the U.S. who are suffering as a result of chemical abortion, it is a worldwide trend. A recent Australian health department audit of nearly 10,000 abortions performed in 2009 and 2010 compared the safety of RU-486 with surgical abortion, with the outcome being in the words of one major media outlet “The Abortion Pill ‘Less Safe than Surgery’”. The Australian report showed that 1 in 18 patients who used RU-486 had to be re-admitted to hospitals (a total of 5.7% of women vs. only .4% of surgical abortions.) The same study revealed that as many as 33% of women who had second trimester RU-486 abortions required some form of surgical intervention. Marketing the abortion drug as simple and painless, such as taking an aspirin, is dangerously misleading to women. RU-486 is in a class of drugs categorized as selective progesterone receptor modulators, which, in addition to blocking progesterone necessary for the developing baby, also suppresses a woman’s immune system. Additionally, it is sometimes the case that the remains of the pregnancy are not entirely expelled from a woman’s uterus, causing infection and other problems. Despite the seriousness and intensity of adverse effects related to RU-486, use of this form of abortion is on the rise, and frequently the regimen is dispensed with less medical oversight than surgical abortion. Even more troubling, nationally and internationally, “telemed” dissemination of RU-486 is increasing. Telemed abortions involved doctors proscribing RU-486 through skype or over the internet rather than during a patient visit. The bottom line is that abortion drugs are not about improving women’s health but are more accurately about advancing a radical pro-abortion agenda regardless of the impact on women’s health, even when it proves deadly. Food and Drug Administration, “Mifepristone U.S. Postmarketing Adverse Events Summary through 04/30/2011” (http://downloads.frc.org/EF/EF11G29.pdf). Jamie Walker, “Abortion pill ‘less safe than surgery’,” The Australian (May 7, 2011) (http://www.theaustralian.com.au/national-affairs/abortion-pill-less-safe-than-surgery/story-fn59niix-1226051434394). EA Mulligan, “Mifepristone in South Australia” Australian Family Physician Vol. 40, No. 5, May 2011 (http://www.frcblog.com/wp-content/uploads/2011/05/Australian-AERs_RU486_201105mulligan.pdf). Michel Martin (host), “Growing Controversy Surrounds ‘Telemed’ Abortions,” National Public Radio (January 24, 2011) (http://www.npr.org/2011/01/24/133182875/Growing-Controversy-Surrounds-Telemed-Abortions). A just-settled Portland lawsuit has called into question the safety of a drug being used in concert with the abortion compound RU 486. The 1997 death of 34-year-old Margaret O’Connor is being blamed on a dose of misoprostol, an ulcer medication that doctors have for several years used to induce labor in expectant mothers. The undisclosed settlement, achieved last month after a two-year trial in Multnomah County Circuit Court, went to Michael O’Connor of Portland. On Jan. 28, 1997, O’Connor lost his wife an hour after she gave birth to their third child at Legacy Emanuel Hospital in Portland. The Food and Drug Administration in September approved the use of RU 486, and doctors have been using Cytotec as a companion drug to complete the chemical abortion process. But FDA figures show 30 cases of rupture of the uterus related to the use of misoprostol, known by its brand name Cytotec. In eight cases, the child died even though abortion was not the intent. In the Portland case, the mother died. Peggy O’Connor was admitted to Emanuel for what Dr. Barry Davis says appeared to be an ‘uneventful’ labor. But Dr. Davis did note that O’Connor was anxious to have the baby and had consulted with another physician, Dr. Joseph Weick, about using Cytotec to hurry the birth and avert complications. The drug had been used in Legacy delivery rooms for less than a year. Dr. Weick said he saw no problem and Dr. Davis ordered the dose. Powerful contractions set in and O’Connor delivered the child. About 20 minutes later, the placenta came. O’Connor, who had had a child previously via cesarean section, then began bleeding profusely. She went into shock, and surgical measures to save her life failed. An autopsy revealed that the placenta had broken off too abruptly and that amniotic fluid entered Peggy O’Connor’s bloodstream. Oregon was one of the states where doctors tested RU 486 and developed protocol for its use. In a pre-trial deposition, the O’Connors’ attorney Keith Tichenor asked Dr. Davis if he had warned his patient of the risks involved with Cytotec before he administered it. Cytotec is manufactured by G.D. Searle, a drug company owned by chemical giant Monsanto. The FDA approved Cytotec as an ulcer medication in 1988. The drug literature from the late 1980s warns, in bold type, against the use of Cytotec by pregnant women. But medical experts are split on the use of the drug during labor. The O’Connor case showed that some strong proponents of its use are at Portland’s Oregon Health Sciences University. It was there, at a 1995 continuing education seminar, that Dr. Davis was told that the ulcer drug Cytotec was a good labor quickener. But doctors elsewhere argue strongly against the drug, citing its tendency to cause the strong contractions and even kill the child in the process of being born. Dr. Marsden Wagner, a Washington, D.C., physician who once worked with the World Health Organization, relays reports from Medford that obstetricians there are using Cytotec to try to fit deliveries into a daytime schedule. ‘We can’t just throw drugs at people in an uncontrolled way,’ Dr. Wagner writes in a recent article in the magazine Midwifery Today. Dr. Charles Lockwood, chairman of obstetrical practices for the American College of Obstetricians and Gynecologists, says that Cytotec is the ‘agent of choice’ for inducing labor in the United States. During the 12-year debate that resulted in the approval of protocol for RU 486, many physicians argued that women should be able to take Cytotec at home to make the abortion process cheaper and quicker. ‘Not being able to use misoprostol at home is a barrier to entry to providing medical abortion services,’ Dr. Suzanne Poppema, Seattle-based president of the National Abortion Federation, said in March 1999. In August 2000, Searle sent an update letter from its Skokie, Ill., office to doctors warning that Cytotec was approved only for treating ulcers and posed dangers to women if used to induce labor or abortions. ‘Serious adverse events reported following off-label use of Cytotec in pregnant women include maternal or fetal death,’ the Searle letter reported. Just last week, two doctors from the American College of Obstetricians and Gynecologists chided Searle for the attempted dissuasion. The editorial, published in the New England Journal of Medicine, charged Searle with letting a fear of abortion politics and potential boycotts override science. Other labor-induction drugs are more dangerous and more expensive, the doctors argued. Though 30 cases may not seem like an epidemic, observers say Cytotec could pose a greater risk now that RU 486 is approved. Doses for causing abortion will be higher than those used to speed labor. Even in smaller doses, the drug causes overwhelmingly powerful contractions in some women and can bring on the kind of rupture and bleeding that killed Margaret O’Connor. ‘I’m not sure this kind of thing is isolated, or if it is, whether it will stay isolated,’ says the O’Connors’ Portland attorney Keith Tichenor.